We found 10 episodes of All the Moore with the tag “faith”. In this episode, we look a baby who floated down a river in a waterproof basket, and then we look at his experience with a spontaneously combusting bush which is not consumed. Passages read this week come from Genesis, 25, Exodus 1-3, and Hebrews 11. For expanded show notes, go to allthemoore.com/18. In this episode, Levi and Aaron take a brief look into the life of Joseph (the one with the coat of many colors) and see how he lived in light of temptation and hardship. Passages read come from Genesis 39-41, Job 38-42, Romans 8. For expanded show notes, go to allthemoore.com/17. In this episode, Levi and Aaron look into God's continued faithfulness in the lives of the Patriarchs as well as Christians today, especially as Jacob wrestled with God and his name was forever changed to Israel--"one who strives/wrestles with God." Passages read in this episode come from Genesis 28, 29, and 35, and 1 Peter 3. For expanded notes, go to allthemoore.com.16. In this episode, Levi and Aaron break from their look into the people of Hebrews 11 and turn their attention to the resurrection of Jesus Christ and the future resurrection of the Church. Passages read in this episode come from Isaiah 26, Daniela 12, Luke 24, John 5, 6, 11, and 20, Romans 1 and 8, and Philippians 3. For expanded show notes, go to allthemoore.com/15. Aaron is back in this episode as we look into the birth of Isaac's children and history seemingly repeating itself as Isaac runs into Abimelech. Scripture read in this episode comes from Genesis 25-26. For expanded show notes, go to allthemoore.com/14. In this episode, we look into the correlation between Abraham's servant searching for Isaac's bride with the Holy Spirit searching and bringing the Bride to Christ. Scripture read in the episode comes from Genesis 22 and 24, Romans 8, and Ephesians 1. For expanded show notes, go to allthemoore.com/13. In this episode, Levi and Aaron discuss old habits and how easily we fall back into them. Abraham fell back into his habit of lying, and God remained consistent in His habit of being faithful. Passages read come from Genesis 20-21, Hebrews 11, and James 4. For expanded show notes, go to allthemoore.com/11. 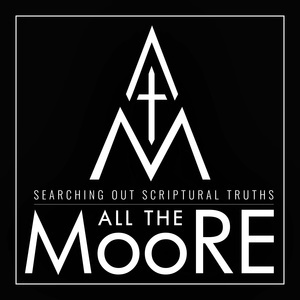 In this episode of All the Moore, Levi and Aaron Moore begin what will be a series of special episodes that look at topics in Apologetics, Church History, or Theology (ACT). This episode focuses on soteriology (doctrine of salvation) and how we are saved by grace through faith. Expanded show notes available at allthemoore.com/10. In this episode, Levi and Aaron tackle Genesis 17-19 where God makes an everlasting covenant with Abraham's descendants and later destroys Sodom for its wickedness. For expanded show notes go to www.allthemoore.com/9.